One of the most fascinating pianists from Finland, Paavali Jumppanen is equally at home on the stage as a soloist or chamber musician. His vast repertoire spans much of the classical piano literature, including Bach, Mozart, and the complete Beethoven Piano Sonatas, as well as contemporary music and avant-garde. His close collaboration with composer Pierre Boulez has resulted in the much acclaimed recordings of the composer's complete Piano Sonatas for Deutsche Grammophon, hailed by The Guardian "the best recorded disc of Boulez's piano music so far." 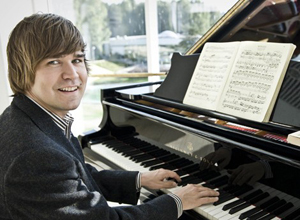 Paavali Jumppanen performed his studies at the Sibelius Academy of Helsinki and subsequently won the 1994 Maj Lind Piano Competition. He went on to study with Krystian Zimerman at the Music Academy of Basel, where he graduated with a Soloist Diploma. Since taking first prize in the 2000 Young Concert Artists International Auditions, he has performed as a soloist with major orchestras all around the world and given solo recitals in the prominent concert halls of Paris, New York, Vienna, and London. He frequently performs chamber music and is an often-seen visitor at festivals like the Kuhmo Chamber Music Festival in Finland.